This part of my 1000 Calorie Counted Recipes Challenge, where I’m aiming to cook every recipe from The 1000 Calorie Counted Recipes by Carolyn Humphries. It’s an amazing book… but there are no pictures! Shred the roast chicken, squeeze over lemon juice and set to the side. Spray a little oil into a large frying pan (one that has a lid) and gently cook the green pepper, red pepper and red onion until slightly softened, which should take 5 minutes or so over a gentle heat. Tip the rice into the pan and stir around for a minute. Add the vegetable stock and turmeric. Bring to the boil, then cover and simmer for 10 minutes. Add the chicken, frozen peas, cherry tomatoes and spring onions. Season to taste. Put the lid back on and cook for a further 10 minutes, or until the rice is thoroughly cooked through. Garnish with chives or other herb of your choice (the book recommends parsely, but I despise it). I felt like this recipe was tasty, well-textured and filling. I would definitely cook it again and the principles of a one-pot veggie and rice dish is one I’ll look to adapt in future for quick, flavoursome, healthy meals. The original recipe only calls for boneless chicken meat – I used leftover garlicky, herby roast chicken and added extra lemon juice to moisten it up. The fact it was previously roasted probably added a few calories, but I feel it also added some crucial flavour and proved to be quite frugal! A bit of chilli or cayenne pepper would have given this dish a kick, which I think it could have done with. This recipe says that it serves 4, so we only ate half of it and will be freezing the remainder in portions to take with us to work for lunches. Win! This part of my 1000 Calorie Counted Recipes Challenge <- click the link if you want to find out what it’s all about and see the recipes I’ve already tried. Please note that I tinker with recipe ingredients and meander from the method – the recipe above will deviate slightly from the original book and the method is just the way I happened to cook it this time! 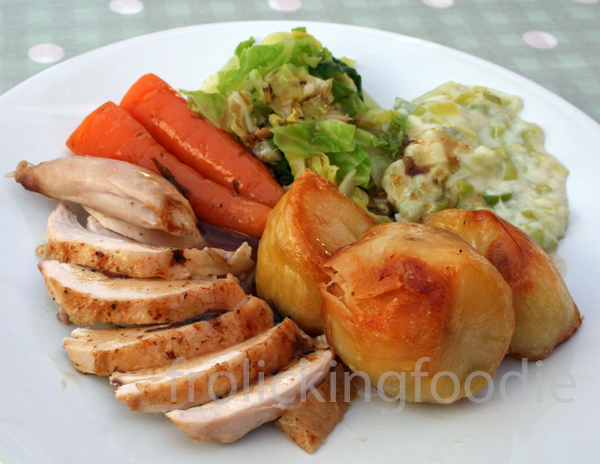 The roast dinner is the cornerstone of great British cooking, and the roast chicken the foundation of so many dishes. Considering this, maybe it seems a bit strange that I’ve not blogged about it yet. Or is it really so strange? I’ve been reluctant to blog about it. Everyone has their own idea of what a perfect roast is, and really anything slightly different from that is just not good enough. I don’t mean just in terms of when things go clearly awry (dad, I’m thinking of those Yorkshire flops I made last week!) but also when a vegetable you love is missing, or prepared differently. Wondering if the dinner would be better still with your favourite Parmesan parsnips can sour an otherwise lovely meal. Think of all the pressure that’s put on Christmas dinner – and how it ought to be perfect. Smugsters point out that a Christmas dinner should be fairly easy as it’s just a roast dinner with extras. True. But they’re probably the same lot who don’t recognise all the expectation that goes into a weekly roast dinner. When anyone presents a roast dinner it is instantly open to judgement: the roast is subject to examination and scrutiny unlike any other meal. This is why I’ve been shy in showing you a roast dinner. First, the chicken . I started the chicken much earlier than I wanted the roast. This leaves time to make the gravy, and vitally lets the chicken rest so it can be carved with ease. As I used a small chicken, I put half a lemon, two cloves of pink garlic (it’s very strong but I would ordinarily use a bit more), three sprigs of thyme and some sage leaves into the chicken cavity. I chopped an onion in half and sat it in the same pan as the chicken. I cook the chicken at about 190, and I keep it covered for 2/3 of the cooking time and uncover it for the last 1/3 of cooking. I baste about three times in total. Now, I never really do cooking times, but I always just if a chicken is cooked by yanking on the leg. If there is ‘give’ in the leg and it doesn’t resist yanking on it, and deep down in the thick of the carcass the meat isn’t pink, then it’s cooked. This is usually about an hour and a half for a small chicken. Now, I ran out of kitchen foil, so without wanting to leave it uncovered I used greaseproof paper. This was a revelation. The chicken didn’t steam during the covered cooking time, but there was still plenty of juice. I’m definitely going to use greaseproof in future! Plus, when it comes to carving it holds the juices well (I’m clumsy and often stab the foil and end up with juices dripping on my feet). At this stage I start on the potatoes. The first step is to peel and cut them. 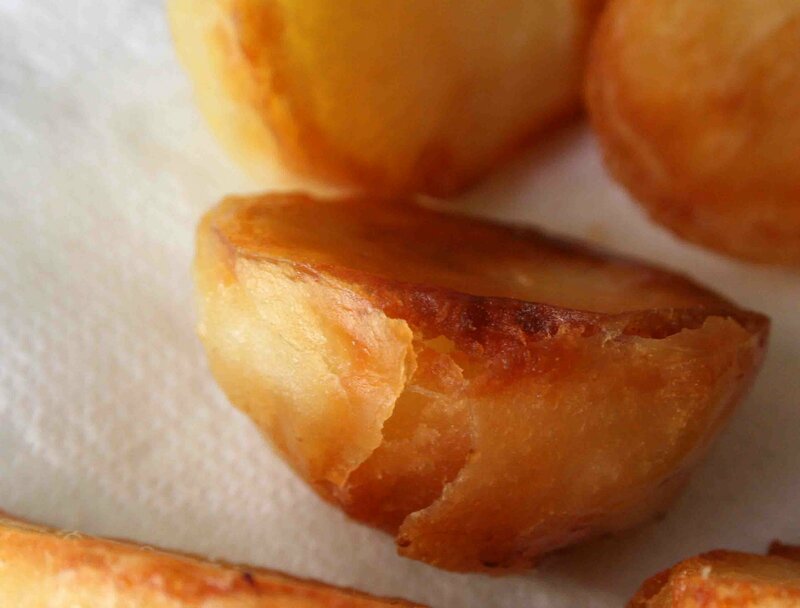 I use Nigella Lawson’s method of cutting on the diagonal, so that each well-sized potato makes three roasties. I then par-boil the potatoes, until a knife goes in without much prodding. The potato should need a little shake to get it off the knife (rather than falling off under it’s own steam which tends to make them a bit over-cooked and liable to disintegrate in the oven). I strain the potatoes and then run cold water over them and then shake them up to get future crispy bits. 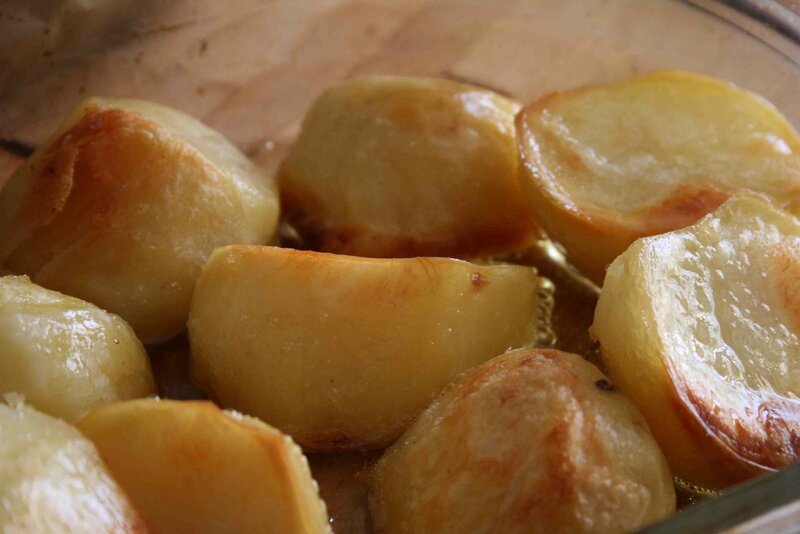 I don’t know why I run cold water over them, but that’s my hocus–pocus part of roast potato cooking (and you’ll find everyone has their own – covering in semolina, using hot hot fat etc). I then made the gravy by removing the chicken and onion (I wrapped the chicken in greaseproof and left on the side and threw the onion in a stock pot), putting the pan on the hob and stirring like mad – getting all the crispy bits off the pan. I then added some salt and pepper. I added cornflour (always mix it with water first in a small bowl and add gradually so that it doesn’t make the gravy lumpy or too thick!) Now, I could and probably should have strained it as there were some oniony bits floating around. But c’est la vie. I poured the gravy in a jug and left – you can scoop off some extra fat when it’s cool and it’s easy enough to heat in the microwave at the last minute. Later, once the chicken was cool, I carved it. To carve the chicken the first step has already been achieved: a well-cooked chicken that has cooled. Your hands are the key to this, and a bird that’s too-hot-to-handle is a nightmare. First, the legs and wings come off (they should come off easily with a tug if the chicken is cooked properly) and then gently ease the meat away from the bones and set aside. The breasts will come off easily too. BUT, the first thing I do is to run a knife down either side of the cartilage at the centre of the bird. I then get to its neck end and find the wishbone and pull this out. Now, it’s a matter of gently separating the breast and under-breast from the carcass. DO it slowly and you’ll leave less waste on the carcass. You then end up with white meat and brown meat separately and very little wastage. I slice both breasts and tear up the brown meat. 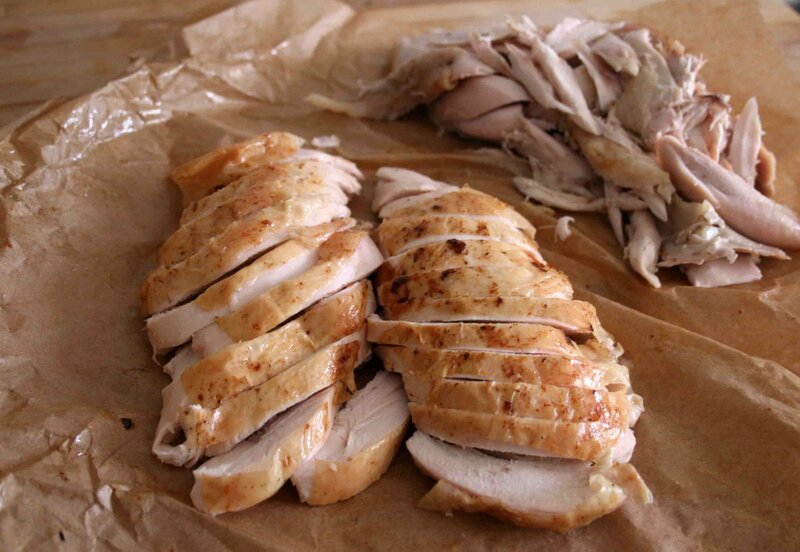 We use one breast for a roast dinner, and the rest of the breast for weekday sandwiches. 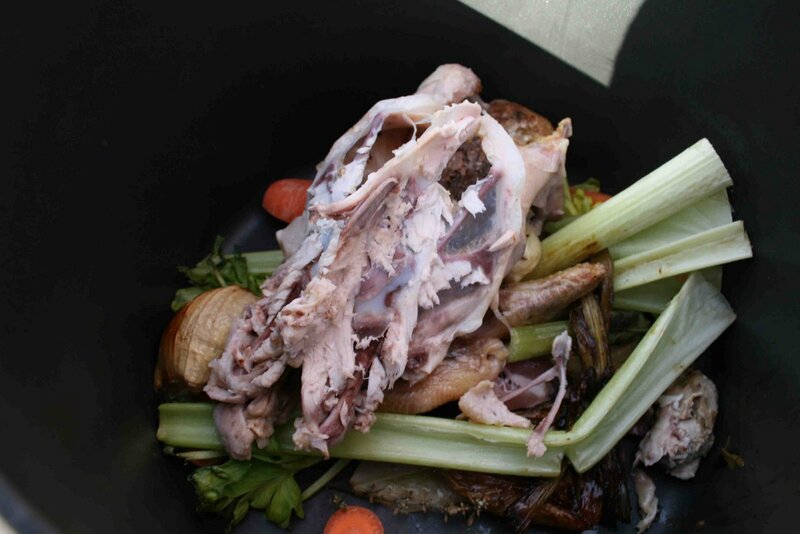 A little brown meat makes it to the roast plate but most goes to a chicken pie or other chicken-leftover meal. You remember I said that cold water was my superstitious way of cooking roast potatoes? Well I clearly overlooked the fact that I will only cook roast potatoes in a glass/pyrex dish. My reasoning behind this is that a bad metal pan is the enemy of crunch – metal holds on to the crispy bits and strips them from your roast potatoes (same rule applies for wedges). So I always use pyrex. Today I used half sunflower oil, half garlicky olive oil to cook the potatoes. The garlicky olive oil is just olive oil I put garlic in and left to infuse… nothing fancy! Sometimes I put some shallots in to roast with the potatoes, sometimes I put whole cloves in. I have come to decide that they detract from the potato cooking so I think I’ll stick to garlicky oil from now on. One vegetable portion that is a firm favourite is the leek. 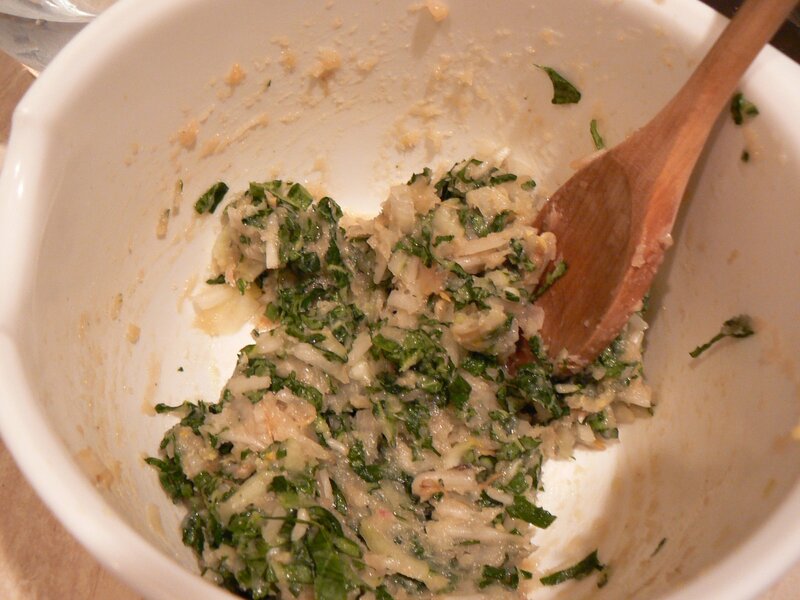 More specifically, when it comes as leek sauce, also known as creamed leeks. 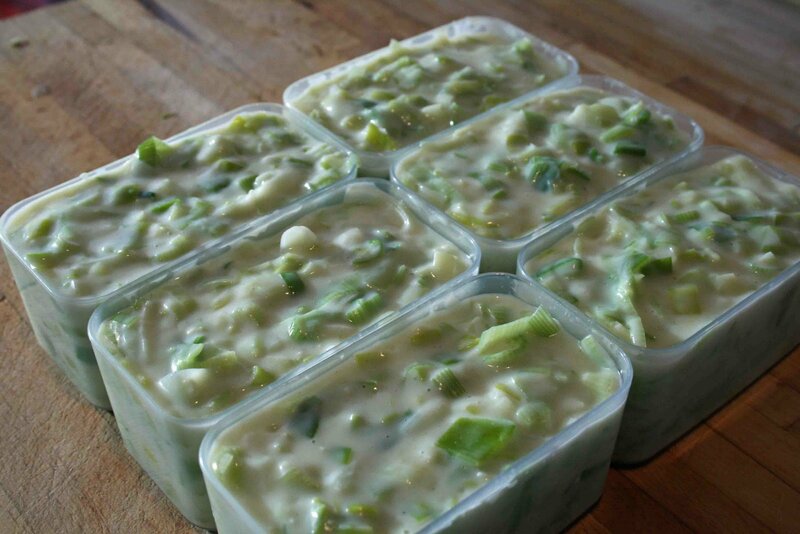 I cook the leek sauce in industrial batches and freeze, partly because it’s a total faff to make it as and when desired, but also to make the most of leeks when they are cheap. I think I made this batch when they were on St David’s day special offer. As you can see from the picture at the top, I also cooked carrot and cabbage for our roast. The carrots I just scrubbed and cooked whole, and the cabbage I cooked by pouring boiling water over, letting it come to the boil on the hob and then immediately turning it off. This way, the cabbage doesn’t seem to over cook. Finally, I put the carcass along with the onion it was roasted with, the garlic (but not the lemon), some pepper corns, a bay leaf, a carrot and some celery into a pot which will be boiled for stock. I had some bacon (the fatty parts that we cut off when having bacon for breakfast) and threw that in for good measure too. SUNDAY I roasted the chicken, with a whole head of garlic a lemon and some sprigs of thyme. We had one of the breasts for our roastie dinner – it’s easy to eat more for no reason when you’ve got all those trimmings to fill you up! I then covered the chicken in cling film and let it go cold so I could dismantle it properly. Sandwiches for the week were made from the other breast, thinly sliced. 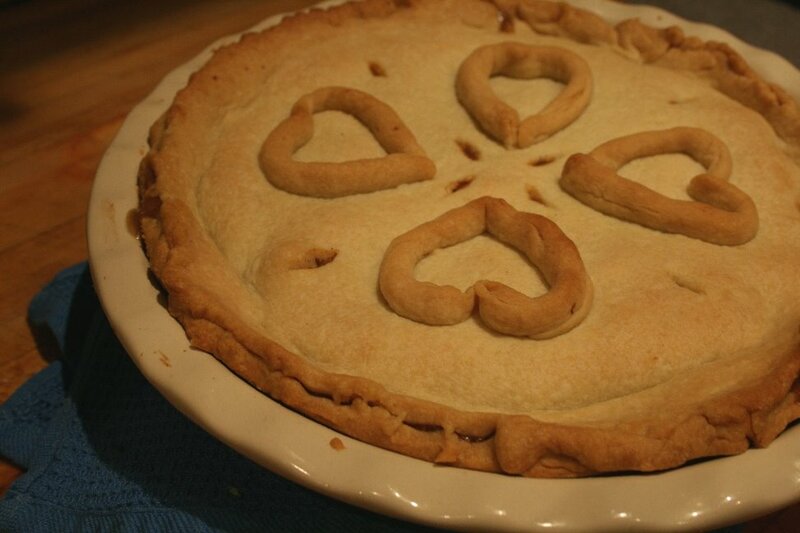 Chicken Pie (enough for two meals – frozen after the first meal) was made from the ‘under breast’ (I don’t know what it’s real name is!) and some of the thinner bits of leg to make the filling. I used the left over gravy and a leek to make the filling, and it was surprisingly good. Chicken Stir-fry was a bit of an experiment, and it worked! We had been to Yo Sushi before christmas I noticed they used what appeared to be already cooked chicken thigh in one of their salads. To replicate it at home, I broke the legs up into fairly hefty chunks, put them in a bowl with a fair swig of: soy sauce, sesame oil, a large grating of ginger, lime juice, some rice vinegar and a dash or mirin. I left them to marinate overnight and sat them on top of stir-fried vegetable and noodles the next evening – very tasty! After a week of picnics, barbeques and celebratory dinners we were 1) very full and 2) left with only a packet of pea shoots in the fridge. It was 8:30 pm by the time we realised we were hungry, and on a Sunday there’s not a lot you can do to remedy the situation. What with Glastonbury coming up, we predicted being sick with take away very shortly so we really wanted something homemade. 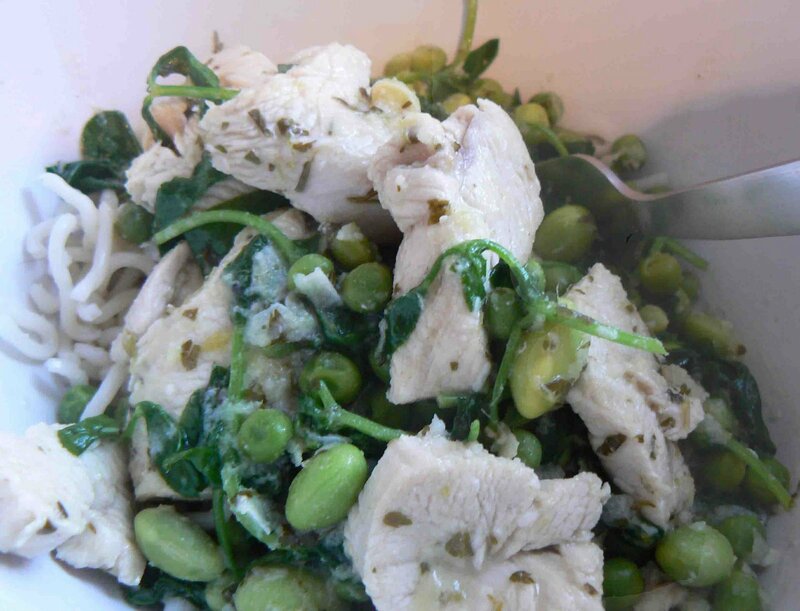 I posted about our trip to Thailand in the afternoon and after a quick look in the kitchen I realised I could make up the basic curry (had all the ingredients in – as an easy storecupboard meal) and add pea shoots and frozen peas and frozen soya beans. I couldn’t be bothered with rice, so we used noodles. This worked remarkably well and we were fed by 9pm. Woop! 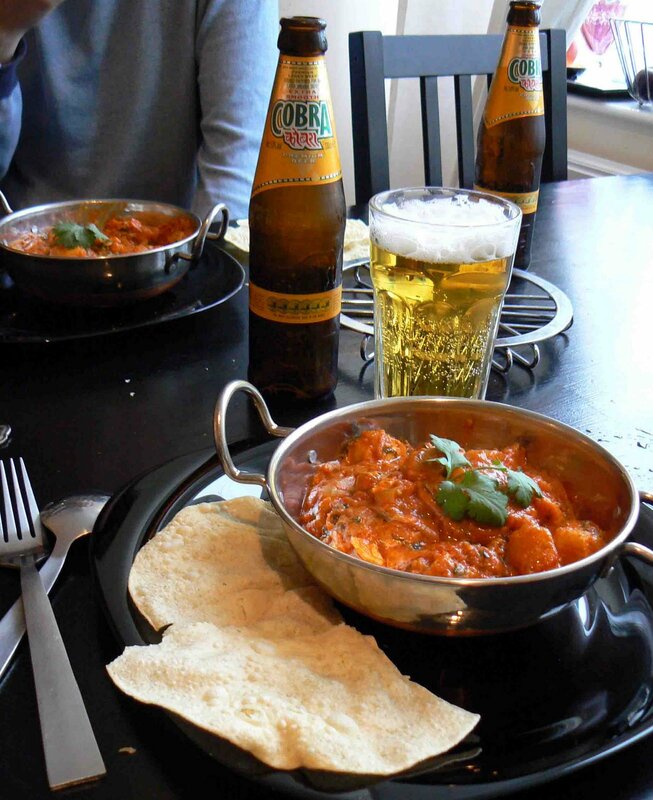 Sometimes only a curry will do, and takeaways have a lovely mouth feel but sometimes only one ‘note’. 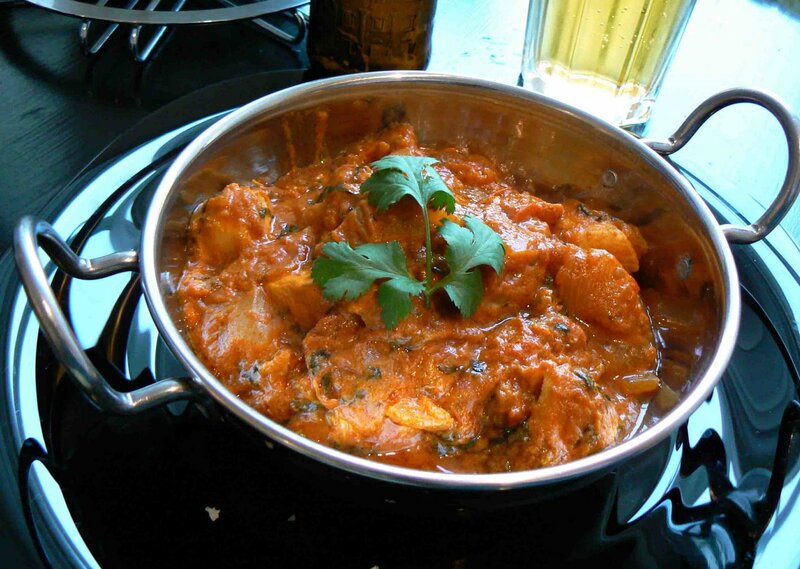 Beneath the heat of this curry, you can taste the mildness of the yoghurt, the lemon and the coriander. I think a rogan josh is traditionally a lamb curry, but we have plans on a lamb curry another day so this time we plumped for chicken. I’ve never followed a recipe for curry before as I usually just bung things together and see how it goes, but I wanted to try a recipe from my “One Pot” book and did so, inspired by Ruth’s “Bookmarked Recipes” event. Chop up the chicken breast and marinade in the yoghurt, garlic, ginger and lemon. Get it in the fridge in the morning for best results. Heat the oil in a large frying/saute pan and throw in the cardamom pods to cook for a couple of minutes. Add the onion, chilli, and cumin and cook for 5 minutes or till the onion is slightly softened. Add the tomatoes, tomato puree and coriander. Allow this mixture to cook down over a simmer for half an hour or so, it should be fairly stiff. Add the chicken in its marinade, which immediately slackens the mixture. Cook with a lid on for about 10-15 minutes, or until the chicken is cooked through. Season with salt as necessary, and add a dash of water if the sauce is too thick for your liking, and it’s ready. I felt this curry could have done with more garlic, so I will be using far more cloves next time – cooked with onion as well as in the marinade. A friend lent me their wagamama cookbook and though the gyoza appealed, I thought the likelihood of me getting my hands on gyoza skins was so small I didn’t note the recipe. When I went to the asian superstore, however, I found some in the freezer section. So I looked around the net, improvised and guessed the filling. I made the above gyoza for a buffet (I made over 40 in total!!) and I fried them to appeal to the masses. You can just as easily steam them or part-fry, part steam them by adding some water in a wok. Although they’re called gyoza (sometimes Beijing dumplings I’ve read) we seem to have got into the habit of calling them potstickers as we usually have them in the more healthy steamed way. I love the flavour of these, and I get to use my swish Cuisinart mini food processor (Christmas present) to zap the chicken. The following recipe makes about 20 -25 depending on how much you stuff them. 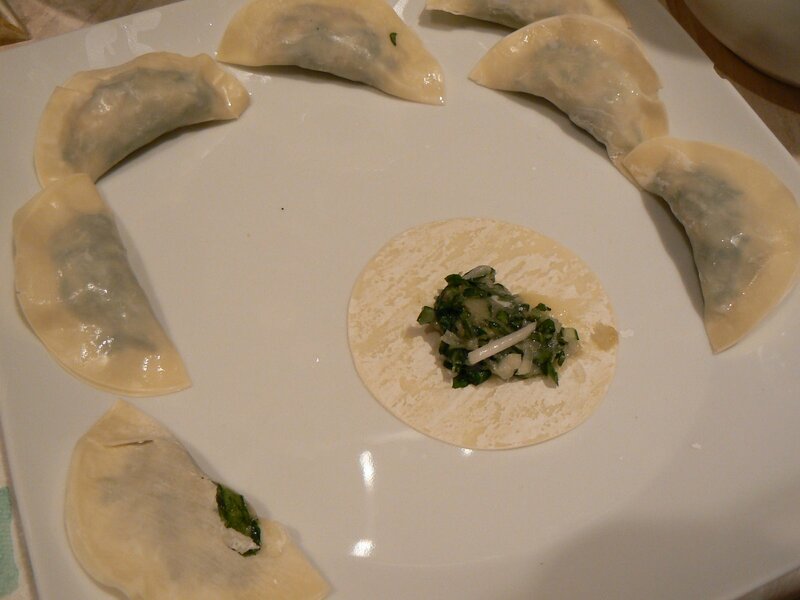 You then put about a teaspoon or so of filling into the centre of each gyoza, wet all round the edges and press round. Apparently very experienced people can do this with one hand. It took me some time… TOP TIP: use an enormous plate to put them on and cover it with cling film (I learnt after the picture below) or they tend to stick to things, including each other. You then cook in the desired fashion. Fry until they go golden brown, steam through (may take about 10 minutes? Check by cutting one open), or fry initially in a wok then add water and cover for 10 minutes or so. There is such a small amount of chicken in each that these short cooking times cause no worry. Leave in a fridge for the flavours to mingle beforehand. These disappear instantly when offered around, so make plenty! 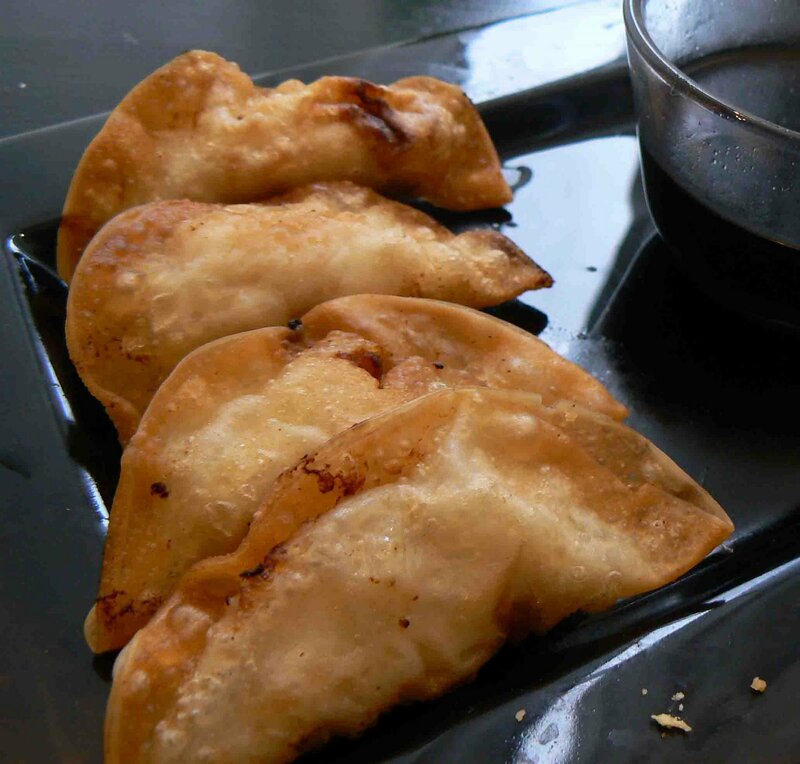 If you have any insights about gyoza, please let me know, I’d love to try variations on this.